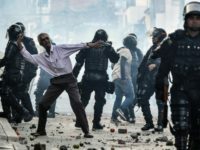 Thousands of people took to the streets across Colombia on Sunday to protest terrorism after the Marxist terrorist group National Liberation Army (ELN) attacked a police academy last week. 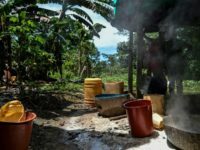 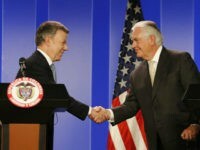 The United Nations Office on Drugs and Crime revealed in a report Wednesday that Colombia produced record yields of cocaine in 2017, a major blow to joint U.S.-Colombian investment in dissuading peasants from harvesting coca leaf and an outcome some conservatives predicted as inevitable to peace talks with the Marxist Revolutionary Armed Forces of Colombia (FARC). 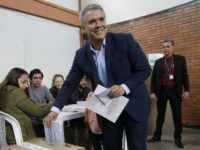 Colombia will see its top two presidential candidates – law-and-order conservative Iván Duque and leftist former guerrilla fighter Gustavo Petro – move on to a runoff vote after Duque won Sunday’s election with 39.14 percent of the vote. 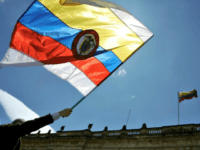 Colombia is preparing to vote to replace President Juan Manuel Santos on Sunday, in an election with significant implications for both the United States and the region as a whole. 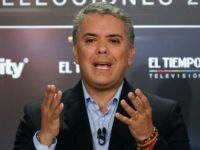 Colombia’s conservative Democratic Center party took control of the upper house of Congress and captured the presidential nomination in a primary open to all right-wing political parties on Sunday, a sign Colombians have shifted rightward since President Juan Manuel Santos legalized the FARC terrorist group last year. 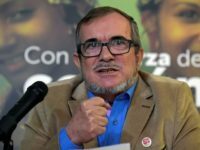 The Marxist FARC terrorist group, now a legalized political party, announced its withdrawal from the Colombian presidential race on Thursday following its leader and presidential candidate, “Timochenko,” suffering a heart attack. 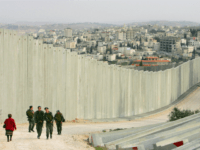 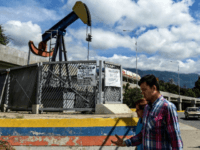 Contents: Parents send kids to orphanages as Venezuela’s oil production collapse; Colombia and Brazil close borders to refugees from Venezuela; Venezuela fears a military ‘invasion’ by Colombia and U.S. 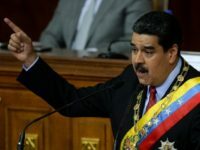 Both the U.S. and Colombia have declared that the upcoming Venezuelan presidential election is invalid as socialist dictator Nicolás Maduro seeks to elect himself to power for a further six years. 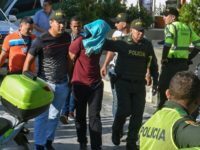 The National Liberation Army (ELN), a Marxist terrorist organization, has taken responsibility for the bombing of a police station in Barranquilla, Colombia, this weekend, killing five officers and wounding 41 others. 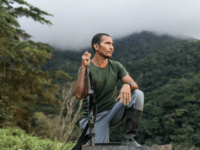 The head of Colombia’s FARC terrorist group and political party announced the creation of forces known as the “Common Tactical Units” (UTCs) to promote the FARC political agenda and get members of the group elected in the 2018 elections. 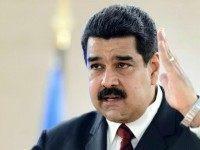 In another extraordinary outburst, Venezuela’s socialist dictator Nicolás Maduro accused Colombian President Juan Manuel Santos of drug-trafficking despite substantial evidence his regime sells huge quantities of narcotics itself. 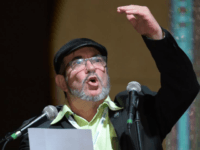 The narco-terrorist group FARC has announced that it has nominated its leader Rodrigo Londoño (alias “Timochenko”) to run for president of Colombia in 2018. 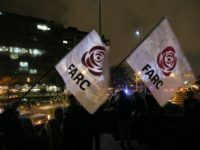 The Marxist terrorist organization FARC–recently relaunched as a political party–has failed to meet the requirements of a peace deal signed in Cuba with the government of Colombia, the U.S. ambassador to that country asserted this week. 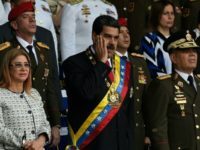 Government officials in Colombia have accused the Venezuelan military of invading the Colombian province of La Guajira, Reuters has reported. 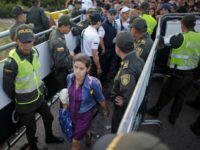 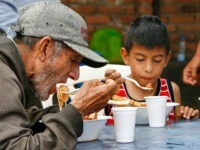 Colombia is preparing for a potential exodus of Venezuelans by drawing up plans for refugee camps, Colombian news outlet El Colombiano has revealed. 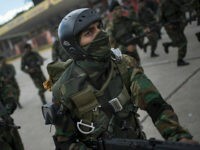 Colombia’s Marxist FARC terrorists have announced that they will launch a political party in the nation’s capital in September, the product of years of peace negotiations with the government of Juan Manuel Santos that will also allow most in the terrorist group to escape prison sentences. 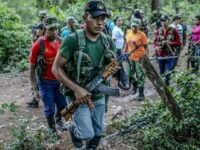 The Colombian government is preparing to reintegrate members of the FARC Marxist narco-terrorist group into its society as they undergo their first round of rehabilitation. 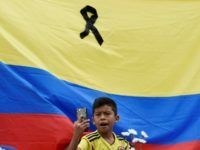 FARC terrorists continuing to stage bombings and kidnappings have marred the process, however, which the Colombian people voted against last year. 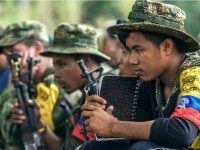 The Colombian government announced Wednesday that it had approved for an amnesty and rehabilitation program four members of the Marxist terror organization FARC, the beginning of the implementation of a peace deal expected to allow 4,500 terrorists to reintegrate into society. 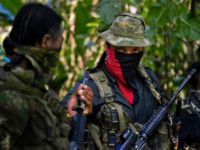 Brazilian and Colombian officials are warning that Brazil’s largest drug syndicate, the First Capital Command (PCC), has begun hiring members of the Marxist terrorist group the Revolutionary Armed Forces of Colombia (FARC) following the signing of a “peace deal” to disarm the FARC. 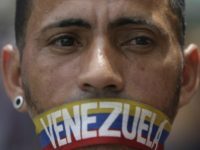 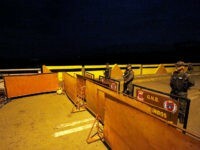 Venezuelan dictator Nicolas Maduro has temporarily closed the Colombian border in an attempt to “destroy the mafia,” whom he claims are taking advantage of the country’s faltering economy.